The most shamefully-satisfying quirk of birders is pointing out bird-related mistakes in popular culture or media. We take a perverse pride in our mock-outrage when - for example - we see movie's shot of a bald eagle accompanied by the screaming call of a red-tailed hawk. It's a phenomenon I like to point out from time to time in these Birds At Large posts. While the targets of these posts are frequently hurried advertisers or unconcerned sound-effects men, no one is immune. Not even the New York Times, that pillar of "respectable journalism." Reprinted below is a screencap from a July 13, 2012 story the Times did on a new HBO movie called Birders: The Central Park Effect. Notice anything amiss (click to enlarge)? Yup, the bird in the lower left isn't the Northern mockingbird as identified in the caption, but a gray catbird. 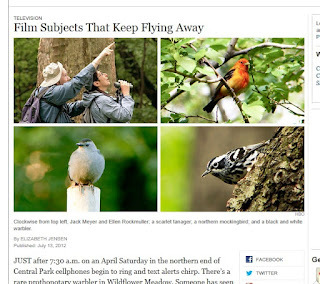 I don't know what lesson to take from this: I could bemoan the quality of journalism in the world today; I could offer an electronic clap-on-the-back to beleagured ad-men out there and tell them they're not alone in their bird-identification-related challenges; or I could just offer-up a high five to the blogosphere (likely half-swung and mistimed, because we're uncoordinated nerds) for pointing out an error in the great and mighty Times. Or I could just get back work. UPDATE: The caption has been corrected. I should also point out that the documentary has been getting great reviews, so go check it out. Good call, Uncle Jas! I mentioned the out-of-orderness in the online Correction form at NYTimes.